It is rumored that cats and new babies don’t mix, but there are many way to keep your cat and make sure your baby stays safe. You’re having your first baby! At least you’re having your first human baby because you’ve had your cat for 10 years already! Since that baby bump made an appearance, all you have heard is how you need to get rid of your feline friend, but that would be too heartbreaking and in a lot of cases unnecessary. Yes it’s true that you can get toxoplasmosis from cleaning a litter box, which can harm a growing fetus. There is a simple solution to this problem and it is one of the many benefits of pregnancy. Someone else has to clean the litter box! For nine full months, it’s not Mom’s job. Mom’s also worry about allergies, but here is some good news: Babies are not born with allergies. Allergies develop over time, so cat dander is not an immediate threat. 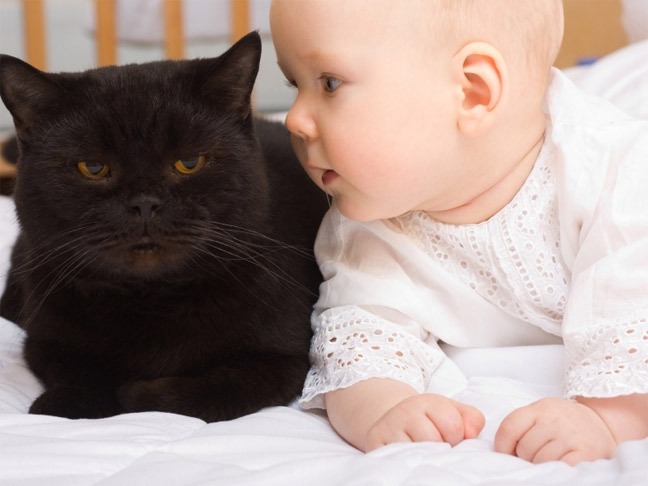 If your child ends up developing an allergy to cats, then you can cross that bridge when you come to it, otherwise count on building a harmonious relationship between your new baby and your old one. Before the baby arrives, get in the habit of keeping your cat out of the baby’s room, especially the baby’s crib. If your cat doesn’t get the hint, crib nets can be used. Crib nets are made from mosquito-like netting that go over the top of the crib, zipping open and shut. Just make sure it is properly installed and keep it zipped shut even when the crib is empty. There is the possibility that your cat won’t want anything to do with your new baby. He or she might avoid the baby at all costs, but if there is contact and a tail or ear gets pulled, you will want to be prepared. Even if your cat is the sweetest cat on the planet, it’s not worth risking your baby getting all scratched up. Soft Claws are vinyl caps that are glued (using non-toxic glue) onto your cat’s claws. They are not only fantastic at protecting furniture, but they also offer wonderful protection from cat scratches. Just keep in mind, that this is an option for a friendly cat. If your cat has a bad temperament, then a new home might be best. The last thing you want your crawling baby to explore is the litter box! If your litter box is kept inside, it should be elevated to a place that your little one can’t reach, while your cat still can. Another option is to use a cabinet or bench that houses a litter box, making an opening only big enough for your feline friend. Not only would the litter box be off limits with the addition of some child safety latches, but it would also be out of sight. Kattbank offers a fantastic but pricey option. For something more affordable, check out the options over at Ikea Hacker.